That's the Edinburgh Festival over for another year. It's been a good few years since I actually attended anything (it was possibly the now defunct T @ the Fringe), but each year things seem to get bigger and louder, though not necessarily any better. In terms of visual art, there was very little to report. 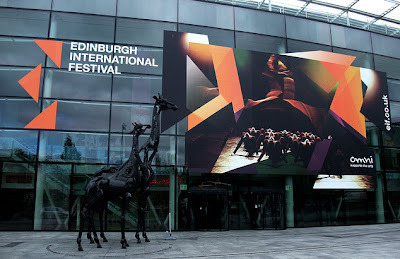 In fact, the Edinburgh International Festival logo was the most interesting thing I saw during the whole three weeks. It comes in a variety of colours and features a swiss-style arrangement of primitive triangles and uppercase typography (in Helvetica of course). The banner in this photo is hanging on the outside of the Omni centre and features the logo in orange. One exhibition I would recommend (which isn't part of the Festival) is 'Another World' at the Dean Gallery - a major selection of Surrealism and Dada by the likes of Miro, Dali and Magritte. As well as paintings and sculpture, there is a large selection of correspondance between the key artists of the era, and a bunch of fascinating magazines, posters and ephemera. Another World – Dali, Magritte, Miro And the Surrealists, Dean Gallery, Edinburgh, Sat 10 Jul–Sun 9 Jan.